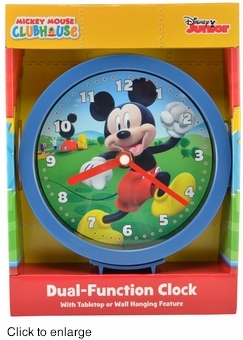 This Mickey Mouse Clubhouse clock is a perfect first clock for for any clubhouse fan. In this clock Mickey frolics in a bright green field with the Clubhouse in the background. The Mickey's clubhouse Disney junior clock is officially licensed and vibrantly colored. This Clock can be wall mounted or will stand upright on a tabletop and features accurate quartz timekeeping.